The King Kooker 25" Tall Portable Propane Outdoor Cooker can be the perfect companion for outdoor parties and camping. This camping stove has a cast burner that..
Includes knife, fork, and spoonCompact and lightweightStores easily and quicklydetailedDescription":"Coleman Utensil Set:Includes knife, fork, and spoonCompact..
Make sure you're always prepared for whatever meal comes your way with the Coghlan's Serving Utensil Set. This item includes a spoon, slotted spoon and spatula,..
Get ready to enjoy the taste of some mouth-watering meals with the Heavy-Duty Rotisserie Grill. This item features a durable, all-steel construction that gives .. The Set of Two Lodge Hot Handle Holders with one Black/White Striped and one Red/White Striped Print makes it safer for you to take hot pans out of the oven. Yo..
1.Model: CA-08A 2.Good workmanship, durable stainless steel, get rusty hardly. 3.Fine design, heat preservation well and long-time. 4.With vents, you can a..
Let the great outdoors become your own personal kitchen with the help of the Stansport 3 Burner Outdoor Stove with Stand. This handy 3-burner stove features a s..
OT 1.2 L Kettle. Perfect for camping or any occasion. Ideal for indoor or outdoor use. Lightweight for hiking and camping. Hand wash only. Ozark Trail 1.2l Kett.. 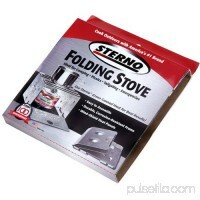 Features: -Portable cast iron one burner camp stove. -High heat output- 200,000 BTU; fully adjustable heat-control regulator knob (paint chipping after use is p..